The new Spider Peak Grip is designed for performance road & sport touring riders. 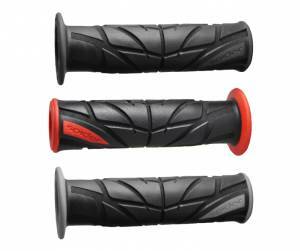 Our goal was to design a performance grip that is more than just a replacement for stock OE grips. The Spider Peak was conceived, designed, tested and championship proven by our Spider Grips Ducati Race Team, and is now available. Racers look for an advantage from every detail on the motorcycle, selecting each part for what it can add to the effort to finish first. While most race teams have to choose a grip off the shelf, the Spider Grips Race Team can make a grip that meets our demands. Originally designed for competition, every feature of the Spider Peak Grip offers something extra for the sport touring and daily street rider. Acoustical Rebound Core: engineered with an advanced boundary layer shaped to dampen and reflect vibration away from your hand. 125mm: grip length and inset grooves for throttle tubes provide easy fit to OE throttles. Bought these from you a couple years back I think and they ROCK! They didnt have as many good "Tailored" models as you have now, but I loved these! Keep up the killer deals - and Happy Holiday Season to you ALL! **Please pass this on to Martin for me as well if you would?